I have found out that Latvia held an orienteering event where the athletes might run into Estonia last year, Latvian Orienteering Championship 2017, long distance. The information said, "in the north – Latvia-Estonia border is located." In the course M21E, the straight line from point 6 to 7 cut through Estonia territory, although the points themselves were in Latvia. Are there more examples of such events where athletes run between sovereign countries? I have vague memories of reading about an O-tour that held an event across the borders of two or three scandi nations. I once rode in a MTBO event that bordered on insanity. I notice in the Latvia map that the trees that escaped into Estonia all scattered when they got there. The Long at WOC 2009 was on the border of Hungary and Slovakia. While the event center was on the Hungarian side, I think it might have been possible to cross into Slovakia while running. Rogainers do it all the time. My wishes for Afghan/Tajik version have been unanswered. They offered U.S./Mx instead but that's beyond my budget for countermeasures. I think there was also one Ostsee-OL were they crossed the border between Germany and Poland but I didn´t run that race. Schengen-Contract makes things like that easier. There was a tour event at the three corners area. As I recall we crossed borders 6 or 7 times on the course. I don't know if it still happens, but there has been a point-to-point relay (6 or 7 legs?) that started not so far from Ed in Sweden and finished in Halden in Norway. I got to run the border crossing leg (1986, I think). The end of the map in Sweden was a bridge that crossed into Norway. Then you flipped your map over and there was another bit of map in Norway to get to the exchange. I think the race was called "grensekuriren." I'm not certain of the name, or the spelling. 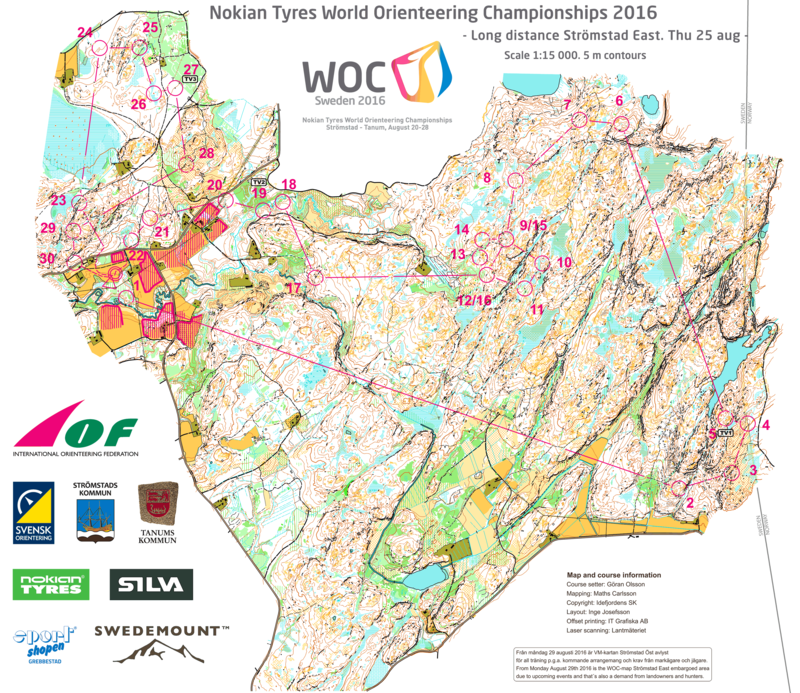 Not really an orienteering race but it was an event that deserves a place in orienteering lore. Back in the 1980s there were two World Cup events happening in North America, one in Alberta, Canada one in Washington State USA. There was a certain Swedish orienteering promoter, a visionary for sure, who wanted to make sure there was representation from the Baltic republics of the USSR and I believe Russia itself. There was not much problem getting visas for the athletes to visit Canada but the USA was difficult, impossible really. So to cut the red tape after the Alberta World Cup event was over the eastern bloc orienteers were driven to southern Alberta, given topographic maps and told to orienteer their way in to the USA and they would be picked up at a point on the other side. Canada and the USA have the world's longest undefended border so getting across the border was probably not much of a problem. Navigating on our topo maps can be a challenge. I guess it was more of a rogaine than an orienteering event but all went well. The USA did not collapse under the weight of the invasion and I think that is how it happened. @Spike: You are absolutely correct about Gränskuriren/Grensekureren, but your 1986 event was a one-year only rerun since the original relay stopped sometime in the seventies when it became obvious that you could not have an un-forked orienteering relay. It alternated direction Ed->Halden, Halden->Ed and it was the last pure running O relay I took part in afair. Porsgrunn O-Lag had a good but very young team around 1974, going towards Halden, where I ran the leg just before the border crossing. I was quite young and had severe problems hanging onto the ~30 teams that were in the leading group. I was dead last except the two times when I noticed that the guy just in front of me was dropping behind the tail, so I had to pass him and catch back up. I was saved by the two controls where the leaders missed and I managed to catch up and find the flag first, then they would start to pass me again. My two year younger brother Knut took over and crossed into Norway and by the time the best runner in the club was out on the last leg we looked to be in excellent position to win, but he tried to outrun the rest of them in the forest instead of waiting for the finish sprint, missed a control and came in as #8 or so. BTW, Morokulien 2-days is a yearly event taking place around the Norway/Sweden border crossing near Magnor, it is about 2 hours east of Oslo. The courses here will often cross the border line. 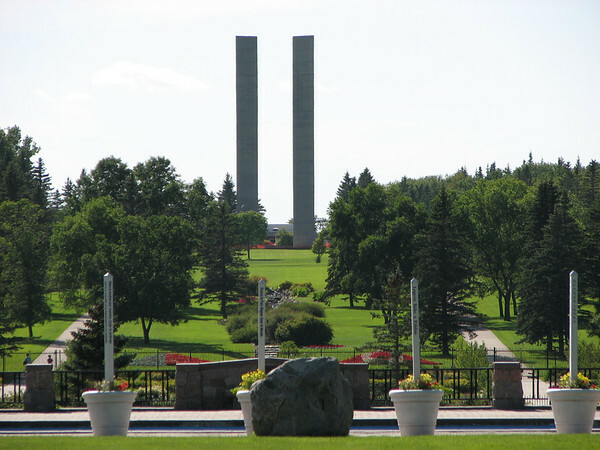 I've often thought that the International Peace Garden between North Dakota USA and Manitoba Canada would be a superb place for a sprint. 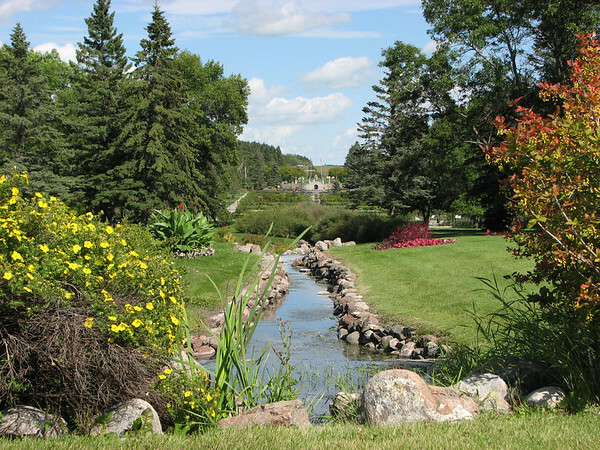 And there's a large provincial park bordering it to the north, but I haven't really looked at the suitability of the terrain in the larger park for longer forest events. I can recall at least two other 1990s World Cup series (both in eastern Europe) where participants have put their forest navigation skills to good use to get into countries without a visa. The Schengen agreement has reduced the need for such activities (at least within Europe). Haven't ever done a cross-border course myself on purpose (although I did cross the German-Czech border by mistake on a map which bordered it on a JWOC 1991 training camp), but I cross into France on training runs on a fairly regular basis when in Geneva. The 1991 JWOC long distance in Berlin crossed the former West Germany-East Germany border twice (one of them in the finish chute). In case you're wondering, the former map (of the western side only) showed the Berlin Wall as two uncrossable fences with out-of-bounds beyond.